Hem is continuing to explore how high-end design can be flat-packed, with the launch of a sofa and a conference table that can be shipped in standard boxes. The Swedish furniture brand is showing five new products in Milan this week, all of which are designed for easy delivery. The most innovative of these is the sofa, designed by Norwegian studio Anderssen & Voll. Called Kumo, this piece of furniture is available with up to four seats. But it arrives as a series of constructed pieces, which can be simply slotted together. Similarly, the Log Table Pro by French designer Julien Renault is a three-metre-long table designed with the workplace in mind. Despite its size, it can be packed flat and assembled by hand. According to brand founder Petrus Palmér, these products epitomise Hem's brand ethos – to make quality design affordable for the masses. "We can fit a three-seater sofa on one standard europalette, so 120 centimetres by 80 centimetres, which – at least to my knowledge – hasn't been done before," he told Dezeen. "That for us is incredibly important, because we ship products from Europe to the US and further," he said. "So being able to pack on a single palette is a big achievement, and being able to do it without compromising the design is an even bigger achievement." Hem started in 2014, primarily as an e-commerce business. It now has a range of over 300 products, by a host of prolific international designers, and ships to 34 different countries. For Milan design week 2018, the brand is showing its latest products at a temporary showroom in Brera. Kumo is Hem's first collaboration with Anderssen & Voll, a studio led by designers Torbjørn Anderssen and Espen Voll. With its modular structure, it can be arranged in one, two, three or four seats, in a row or corner configuration. But it can easily be taken apart and reassembled. "We told Petrus that we wanted to make something that was between a running shoe and a tent," explained Voll. "But when we tried to make this as a tent, it didn't really come together." "We thought, we have to be able to do this in a more simple way," he said. "So it switched from being this tent structure with lots of loose tubes, to being more of a mix between a modular kitchen and a stackable chair." The sofa is available in a range of woollen fabrics or in leather. The Log Table Pro is the latest in a series of tables designed by Renault for Hem. Underneath its laminate surface is a honeycomb structure, which makes it both strong and lightweight. It also has metal legs. Other new launches include Kendo, a chair by Italian studio LucidiPevere. It features a curved backrest, which comes in three colours, and detachable legs in wood or metal. Cologne-based designer Karoline Fesser has contributed a new version of her powder-coated steel Hide Pedestal, featuring three tiers of shelves, while Milan-based fashion designer Arthur Arbesser has created a striped rug made from New Zealand wool. "There are always a lot of geometrics in my work, a lot of lines, but I like to do it an orderly geometric way," explained Arbesser, who has previously worked with Hem on a number of textile products. "It's nice to give an accent in a room, or to add to some sort of joyful geometric to a chair or a sofa," he said. 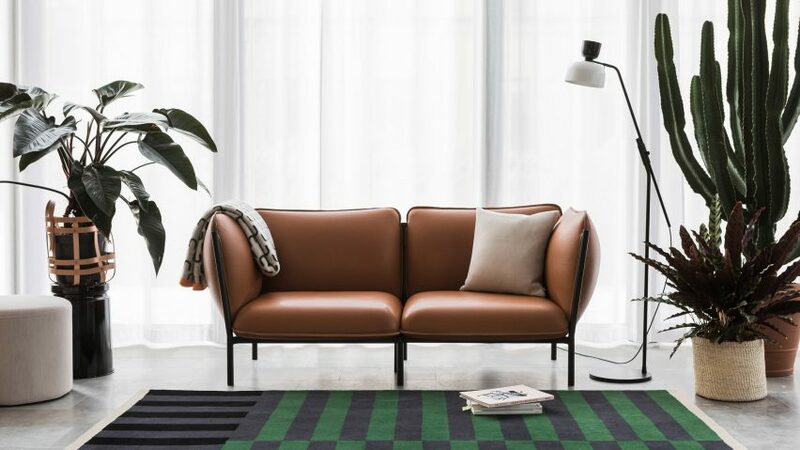 Hem will also use Milan design week to showcase two products it launched at Stockholm Design Week earlier in the year: a series of patterned throws, also by Arbesser, and a floor-lamp version of Luca Nichetto's modular Alphabeta lighting. "The main idea of this lamp was to create a true alphabet," Nichetto explained. "The idea was to create a lamp that you can combine – you can create your own lamp for the function that you want to have." Hem ranked at number 433 on Dezeen Hot List 2017. Other popular products by the brand include the Last Stool by Max Lamb and the Bon pouffes, designed by Hem's in-house team. Palmer will also be a judge for the inaugural Dezeen Awards. The brand's latest offerings will be on at Via Statuto 8 from 17 to 22 April 2018, as part of Milan design week.